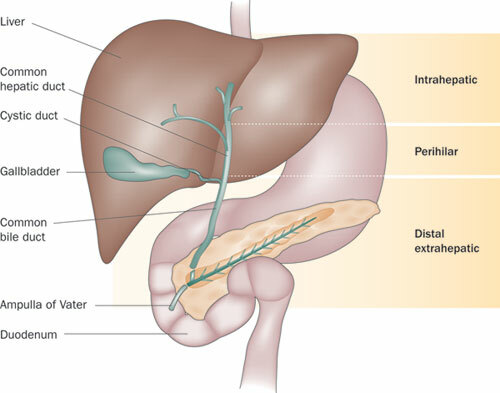 Cholangiocarcinoma is bile duct cancer.These tumors in the liver can be small or large. When cancer develops from the cells of the bile ducts both inside and outside of the liver, the condition is called cholangiocarcinoma. This form of cancer contains mutated epithelial cells and that emerge in the bile ducts. These bile ducts drain bile from the liver into the small intestine. Cholangiocarcinoma can prove life-threatening and incurable if both primary tumor and any associated metastases are not removed. Abdominal CT scan: Computed tomography scan of the abdomen where pictures of the abdomen including cross-sectional pictures of the belly are taken. Biopsy: A biliary tract biopsy removes small quantities of cells and fluids from the bile ducts and examined under a microscope. Cytology samples: Samples from the bile duct are taken to evaluate for cancerous or precancerous changes. ERCP: ERCP is an endoscopic procedure to increase the accuracy of the biopsy. MRCP: This is a non-invasive test conducted with the help of resonance imaging to view the internal organs. PBD: Percutaneous biliary drainage done as an x-ray of the bile duct. Liver function test: This is a blood test done to assess the elevation of alkaline phosphatase and bilirubin levels.